Preschool Video Art Lessons Super Bundle - You ARE an ARTiST! 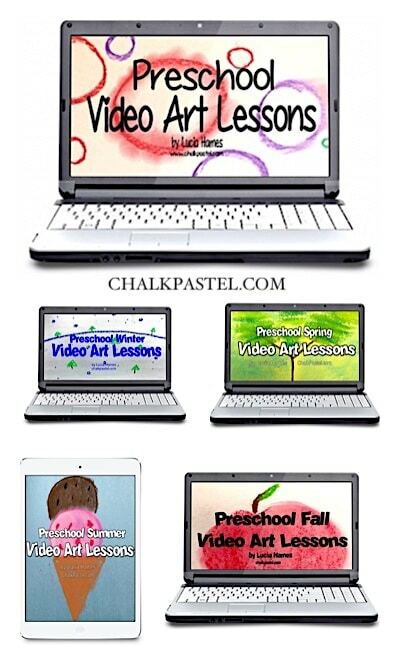 Five online Preschool Video Art Lesson courses for one discounted price. Your preschooler will love having the beginning art lessons and fun seasonal lessons for the whole year! 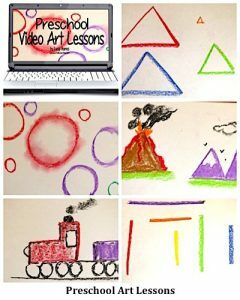 All it takes is a starter set of chalk pastels, construction paper and these video art lessons to enjoy preschool art! No expensive, intimidating list of art supplies. 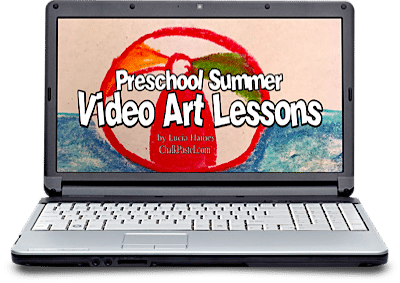 Preschool Video Art Lessons are a wonderful stand alone art curriculum and a perfect complement to your preschool learning. 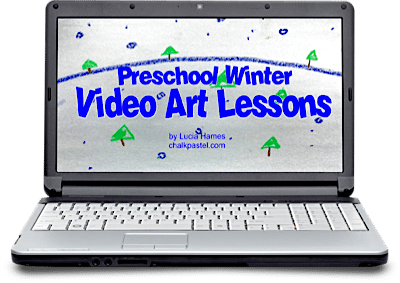 We show you how in our Preschool Video Art Lessons. 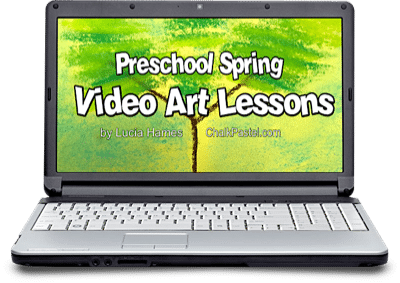 How to view the Preschool online video art lessons? Try a free preschool art lesson and learn about the simple start in chalk pastels! Your youngest artists can join in the learning fun with these videos too! Preschool Chalk Pastels: An introduction to chalk pastels. The simple and very short supply list plus practical tips for using chalk pastels with preschoolers. How to Teach Preschool Art: Extra advice for parents and caregivers on how to join the fun of preschool art. 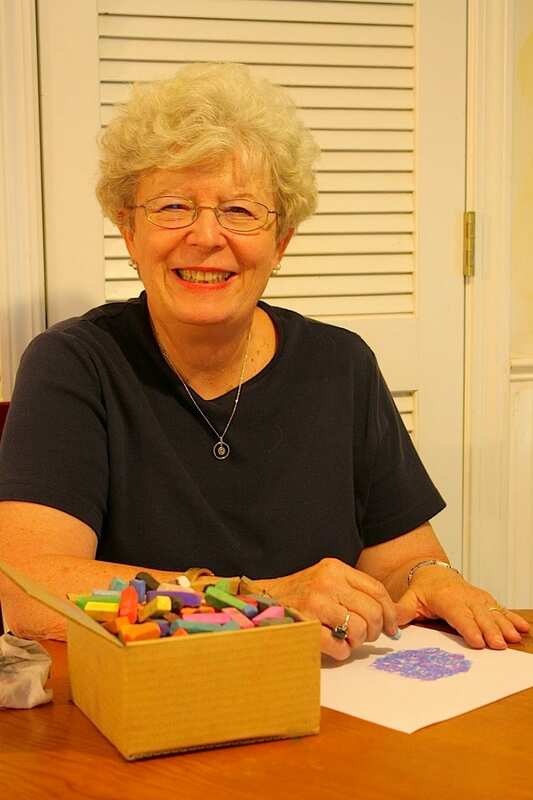 Encouragement on how important praise is for a preschooler to develop a lifelong love of art! How to Build Pictures with Shapes: Simple steps for lines and shapes to show your preschooler how to make familiar, every day items out of shapes. Circle: BIG ones, little ones, red ones, green ones! Square: Learn how to make straight lines connect and “shake hands” with other lines to make a square! Triangle: Three lines and you have a volcano with red, fiery lava flowing down a side or a purple mountain with snow on top! Lines: Oh the places you can go with a straight line – squiggly, short or long! Apple – turn a chalk pastel stick on its ‘tummy’ and pull the color around to create an apple! Candy Corn – paint as many as you’d like! Snowman – simple lines and circles help you paint a fun snowman! Snow – what you might see floating slowly outside your window. Each snowflake is unique! Winter Scene – it’s fun to ‘paint’ a winter wonderland with triangles and circles! Star – learn how to paint a star – step-by-step! Yes you can!